Max and Keith Richards: Both Still Alive - . Max does this thing where he looks super dead, floating motionless at the top of his little tank and yet, he's very much alive. Max the Wonderfish is near four-and-a-half-years-old. His life expectancy is two to four years, so he's beating the odds. 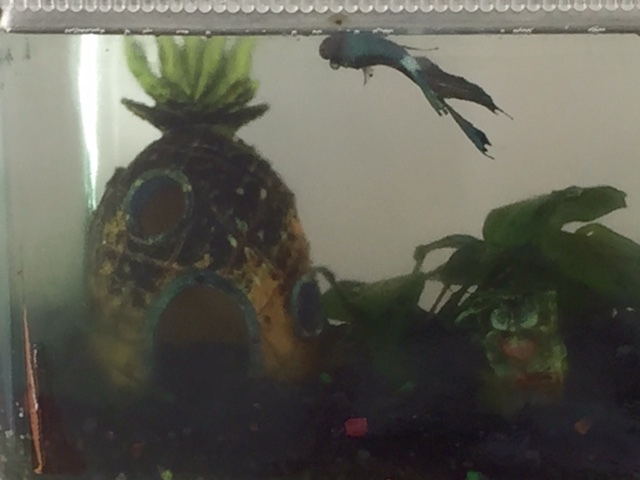 A year ago, we thought he was gone but he just keeps on partying down in his Sponge Bob Pineapple House. Bravo, Maxy. P.S. Don't tell Max about Abe Vigoda. Max is an incredible actor. We have a gerbil that sleeps on his back with his mouth open. Max is living the meme.